MANY of the holiest men in Ireland were present at the Synod of Teilte. 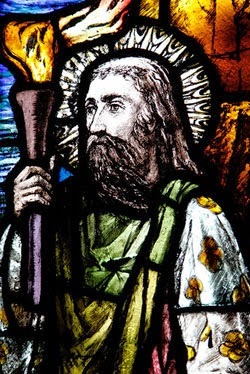 St. Enda of Aran had passed from his life of penance to the glory which is eternal; but St. Brendan of Birr, and probably his namesake the Bishop of Clonfert, with his assistant St. Moinen, Oena of Clonmacnoise, successor of the saintly Ciaran, and St. Kevin of Glendalough, formed part of the Council. 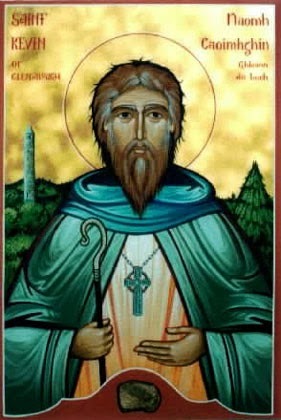 When Columba was seen approaching in the distance, St. Brendan of Birr alone arose and went forward to receive him. The Fathers objected to his action. It was not fitting, they said, that one who was under the grave censure of the Church should be greeted with marks of deference and honour. "If you saw what I see," replied the holy Brendan, "you would hasten to do likewise. I see Columba, as he climbs the hill, surrounded by a column of light, and angels going before and after him. I bow before the Hand of God which destines him to convert a whole nation to the faith of Christ." 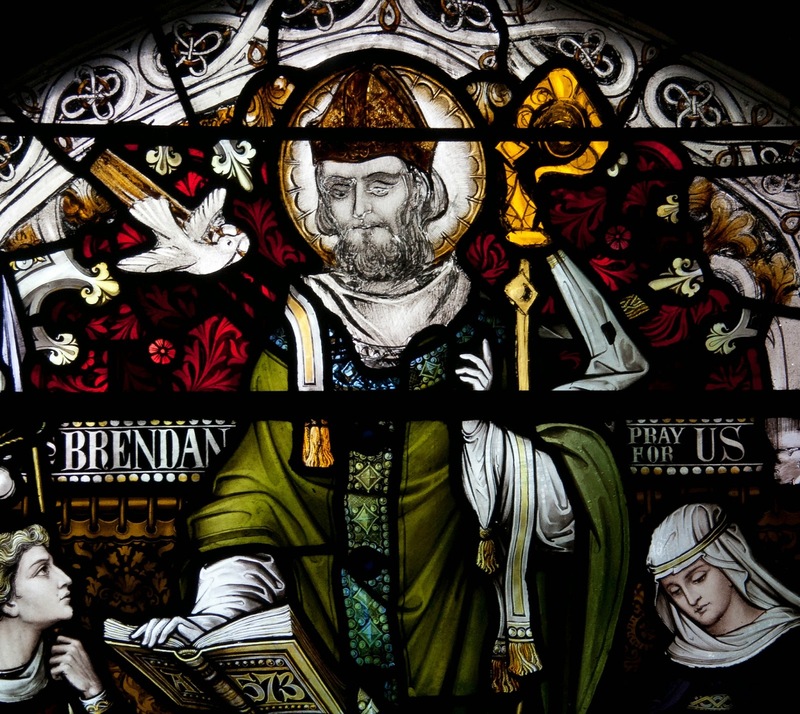 His words made a powerful impression on the assembly, for the wisdom of Brendan was known to all; and there was a deep silence as Columba entered. After a short pause one of the elders arose and stated the case in words that were brief and simple. Columba, he said, was under the censure of his brethren for having stirred up strife in the King's dominions, which had led to a fierce and bloody battle. "The King's behaviour was unjust," replied Columba, "and it is hard for a man to bear injustice patiently." "Truly, as you say," answered the speaker, "it is hard for a man to bear injustice; yet judge yourself if it is more fitting that one who has dedicated his life to the service of Christ should bear injuries patiently, or that he should avenge them at the point of the sword." He went on to speak of the duties of a Christian and of a priest; of the insults and humiliations offered to Jesus Christ, their Master and their model. The words were of one who had himself striven and conquered—of one who had a right to speak. The silence deepened, for the Spirit of God was with him. Alone in their midst stood Columba, but his head was bowed upon his breast, and the grey eyes that had dashed so stormily at the Court of Tara were dim with tears. The cry that burst from his heart when the old man ceased to speak was the cry of another great penitent—one who in spite of human frailty had deserved to be called a "man after God's own heart." "Against Thee only have I sinned and done this evil in Thy sight: For I acknowledge my fault, and my sin is ever before me." The fault had been great, but the sincerity of the repentance was evident to all. "Go in peace," was the verdict of the Council, "and for every man that fell on the field of Cuil-dreimhne win a soul to the faith of Christ." Sentence had been given, but Columba was not content. He had grieved that Lord Who from his childhood had been the sole love of his heart, and no penance was great enough to satisfy him. Moreover the fate of the men who had fallen at Cuil-dreimhne was an intolerable burden on his soul. Through his fault they had been hurried—perhaps altogether unprepared—before the judgment-seat of God. The thought that they might be lost for all eternity was a perpetual torture to him, and he went from one to another of the Saints of Erin seeking advice and help. In due time he went to St. Abban, like himself a monk, and the founder of many religious houses. Men called him the "Peacemaker," such was his power over turbulent and violent men. Not long before, he had gone alone and unarmed to meet one of the fiercest barbarians of the land, the heathen chief of a reigning clan, and the terror of the surrounding country. Such was the influence of Abban that the marauder laid down his arms, and became in course of time not only a Christian, but also a monk of exceptionally holy life. Columba found St. Abban in the Church of one of his religious foundations, known amongst the people as the "Cell of Tears" on account of the contrition of the penitents who frequented it. He besought the holy abbot to pray for the souls of those who through his fault had met their death, and the thought of whose fate had destroyed his peace. He entreated Abban also to pray to God that He would reveal to him through the angel who spoke to him continually of the things of heaven, whether they were saved or lost. The humility of the holy abbot would not allow him for a long time to accede to this last request; but in the end, so moved was he by the anguish of Columba, that he fell on his knees and implored of God to give this comfort to a soul in pain. The knowledge that he asked was given him; he returned with great joy to his visitor to tell him that, through the infinite mercy of God, the souls of all who had fallen on that fatal day had been saved. The chief solicitude of Columba was now at rest, but the future was not yet clear before him. How was he to mould his life that the days to come might be an atonement for the fault that was past? He had learnt his own weakness, he must lean more than ever on the Strength that cannot fail, and the desire for a more perfect expiation was strong in his heart. He determined to seek out St. Molaise, his "soul's friend," in the lonely isle of Inishmurry and to ask his counsel. St. Molaise knew well the character of his penitent. The penance that would satisfy that great heart must be full and complete. To Columba the love of country came next to the love of God; the decision was taken ere the penitent had ceased to speak. It had been decreed, said he, by the Synod that Columba was to win to the faith of Christ as many men as had perished at the battle of Cuil-dreimhne. Let him do so; but that the atonement might be more perfect let him go forth from his own people and his own land, and never look upon the hills of Erin again. Columba bowed his head before the sentence. "It shall be done," he answered, and none but God was to know what the doing cost him. It only remained to break the news to his friends and kinsfolk. A wail of sorrow rang through Tir-Connell at the tidings. It is not surprising that the land of Alba over the sea suggested itself at once to Columba as the place of his exile. The little kingdom of Dalriada on the Argyllshire coast was ruled by one of his own kinsmen, and reports of the condition of the surrounding country had possibly reached his ears. The Christianity introduced by St. Ninian two hundred years before had almost disappeared. The ruling chiefs were completely under the influence of the Druids, and heathenism and idolatry were supreme throughout the land. There his apostolic spirit would be able to find ample scope. We are told by some of the old writers that the thought of a missionary journey to Caledonia had been for years one of his dearest projects. If that were so, the time had now come to put it into execution. Columba chose the companions who were to share in his great undertaking from amongst the monks of Derry. Two cousins of his own, Baithen, who was to succeed him in after years as abbot of Iona, and his brother Cobthach, were amongst the number. But the disciple who loved him the most was Mochonna, son of the King of Ulster, whom Columba considered too young for an enterprise that involved so many dangers, and to whose entreaties he refused to yield. It was not fitting, said he, that the young monk should leave the country of his birth and the parents to whom he was so dear; but Mochonna would not be gainsaid. "Thou," he cried, "art the father of my soul, and Holy Church is my mother, and my country is the spot where I can work most fruitfully for Christ." Then, that it might be impossible for his beloved master to leave him behind, he made a vow before all who were present to quit his native land and to follow Columba to the death. It was in this wise that the determined and devoted Mochonna overcame all opposition and obtained his heart's desire. He was to become one of the most active and zealous of the little band of missionaries, in Alba, where he was venerated for many centuries under the name of St. Machor, as the patron and founder of the See of Aberdeen. Thus, with only twelve companions, in the wicker-work "curraghs" covered with oxhide that were the only boats of the Celtic races at the time, the future apostle of Scotland set sail from his native land. A great crowd, gathered from all the surrounding country, stood on the shore, and as the light skiffs sped out into the sea, and the green hill of Derry faded slowly from the eyes of the mariners, the sound of a bitter wailing was borne to them on the breeze. The best beloved of the Saints of Erin had left her, and she mourned for him as one lost to her for ever. WESTMONASTERII, die 7 Octobris, 1913.